Dorsal horn microcircuity. This R01 was just renewed for a third five-year period to study the spinal neuropeptide Y Y1 receptor as a novel pharmacotherapeutic target for chronic pain. They Taylor lab’s initial work indicated that intrathecal administration of NPY acts in a dose- and receptor-dependent manner to reduce behavioral signs of inflammatory pain and peripheral neuropathic pain (Taiwo et al, 2002; Intondi et al, 2008). They then discovered that an injury-induced enhancement of endogenous NPY-Y1 receptor GPCR signaling could be maintained long enough to confine chronic inflammatory and neuropathic pain within a state of remission (Solway et al, PNAS, 2011). The objective of the current renewal is to determine whether injury induces a sustained spinal release of NPY, leading to the inhibition of pronociceptive Y1R-expressing interneurons in the dorsal horn. 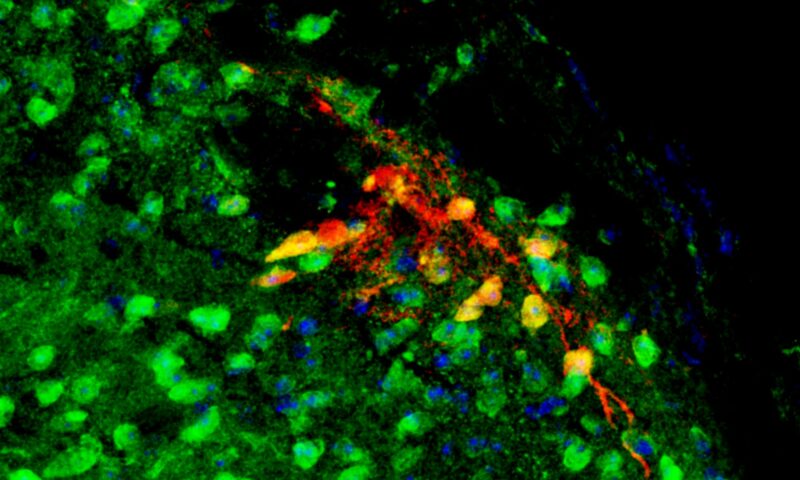 To achieve this, they are implementing transformative neuroscience and biomedical research approaches – new innovative methods to measure neuropeptide release in vivo, a new approach to microinject AAV virus into mouse DRG, GCaMP6 imaging of neuronal activity both in the spinal cord slice and the whole animal, optogenetics coupled with patch clamp neurophysiology of adult Y1R-GFP and other Y1R transgenic mice to study the microcircuitry of pain modulation in the dorsal horn, and chemogenetic neuropharmacology using DREADDs. Solway, B., Bose, S., Corder, G., Donahue, R., and Taylor, B.K. Tonic inhibition of chronic pain by Neuropeptide Y. Proceedings of the National Academy of Sciences 108:7224-9 (2011). PMID:21482764. Intondi, A.B., Dahlgren, M., Eilers, M., and Taylor, B.K. Intrathecal neuropeptide Y reduces behavioral and molecular markers of inflammatory and neuropathic pain. Pain 137:352-65 (2008). PMID:17976913. Taiwo, O.B. and Taylor, B.K. Antihyperalgesic Effects of Intrathecal Neuropeptide Y during Inflammation are Mediated by Y1 Receptors. Pain 96:353-363 (2002).